AS WE ENTER into the fourth year of our organization, we continue to gain momentum with our work on behalf of our farmer-members. In order to continue this success, we need your involvement and input. That is why I encourage you to attend your Annual District Meeting this month. At these meetings you will receive updates on our activities in the areas of trade negotiations, market development initiatives, how we are investing research dollars, and what and how we are communicating to government representatives and the general public about important farm issues. Your District Meeting is one of your opportunities where you can ask questions and let your views be known. A recent regulatory review of Grain Farmers of Ontario under the Farm Products Marketing Act has allowed us to change the process in which our Directors are elected. Beginning this year, Directors will be elected to two-year terms. This new term period will be phased in with even numbered districts electing a Director to the new two-year term this January. Two year terms for Directors in odd numbered districts will begin in 2015. This will allow for more stability and consistency within the leadership of our organization. You can find a full listing of all district meetings in the GFO Newsletter section of this magazine; the schedule is also posted online. If you can’t attend your District Meeting, I encourage you to speak with your Director or with one of your local Delegates about the issues you feel are important to the future success of Grain Farmers of Ontario. One sign of the momentum of the organization is our decision to purchase an office building. As was discussed at our 2013 Annual General Meeting and noted in our Annual Report, we have been assessing our immediate needs for office space and the long-term future of the organization. 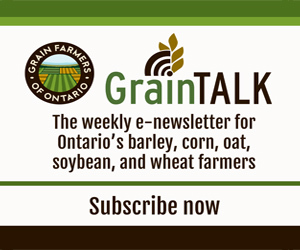 A cost-benefit analysis has shown that given the longevity of our organization it is a better value for Grain Farmers of Ontario to purchase a building rather than continue to lease. Rest assured, we have taken a practical approach to our needs and have purchased a building which meets our current needs but also offers room for us to grow. Our move is expected to take place in March. We will continue to be based in Guelph.